* Burger King Just Fired a Huge Shot in the Fast Food Wars: $5 for a Month of Coffee. You could save literally hundreds of dollars on coffee every year. The only thing better than a sweet hit of that morning caffeine is getting a discount on it. That’s why Burger King’s new deal might change how you drink coffee. The fast food giant has essentially launched the Netflix of coffee: a coffee subscription service where, for $5 a month, you can fuel yourself with a small, hot black coffee each day at participating Burger King locations. Download the Burger King app for iOS or Android (or sign into your account if you’ve already taken advantage of BK’s previous mobile-only deals). 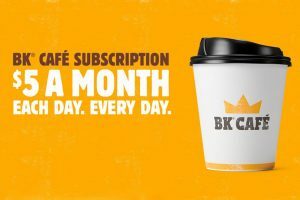 Sign up for the BK Cafe Subscription Program, and prepay $5 for the month. The subscription will automatically renew, so if you just want to try it out, set yourself a reminder for the end of your billing cycle to re-evaluate keeping the subscription. After you sign up, each new calendar day for the next month you can swing by any participating Burger King (excluding some locations – check here to make sure there’s a location near you) and use your Burger King app to unlock a “free” small, hot black coffee. The coffee subscription does not include other drinks, types of coffee or food, but it’s reasonable to assume this may be a test run for future fast food subscriptions. A small black coffee at most Burger Kings costs $1, give or take local tax. If you drink one coffee each day for the month of April without the subscription service, you’ll pay $30. But with the new subscription, you’re now paying $5 for 30 cups of coffee in April. That breaks down to just over 16 cents per day for your coffee fix and cuts your caffeine costs by about $25 — or almost 84 percent. Multiply that by a year, and you’re saving hundreds of dollars. Even if you only buy Burger King coffee five times per week, you’re still drinking approximately 20 cups of coffee per month. Using the Burger King Cafe Subscription program you’ll save $15, or 75%, of your total costs. And for the Starbucks drinkers out there, the Burger King coffee subscription is like getting a full month of coffee for less than the price of a Venti Latte and a cookie. What better way to deal with your daily commute than by enjoying a coffee that’s already been paid for? And to keep up with the latest fast food news and discounts, take a second to set a Deal Alert with us. Thanks to msserious for spotting this deal. This is a brilliant deal. Very smart move by BK. WONT HELP. THEIR COFFEE STINKS.